My friend, Meg just bought a wonderful California bungalow for herself & her poet-writer-teacher-soon-to-be-hubby & her sweet sweet baby boy, Abe. I haven’t seen Meg since last year’s Friendsgiving (definition: drinking & eating good food with friends on T-day) when Gift Fox gifted her this modified Around-the-World quilt. Since I live on the East coast and Meg now lives on the West coast, it’s hard to keep up with each other’s busy lives. It makes one wish teleportation was real, since I miss Meg’s unique vim & vigor in my everyday existence. Meg’s fierce. Like Tyra Banks, America’s Next Top Model fierce. This ferocity: maybe it stems from her being a devout Giants fan and/or maybe it stems from her being a former pageant girl from Nevada. I first met Meg, then a MFA nonfiction graduate student, at a picnic table, by a fire pit, outside in late May, at our mutual friend, Marla’s house in Portsmouth, New Hampshire. It was still cold at night, and everyone was dreaming of summer. And then I met her again that Fall in Meredith Hall’s memoir workshop course and had the true pleasure of reading Meg’s work, stuff I’m still thinking about every time I write about my own life. What’s so great about Meg is that it’s precisely the strong dose of sun that she radiates that motivates people to be their best selves or die trying. She’s a cheerleader and a do-er with a sharp eye and a laugh that wins you over. 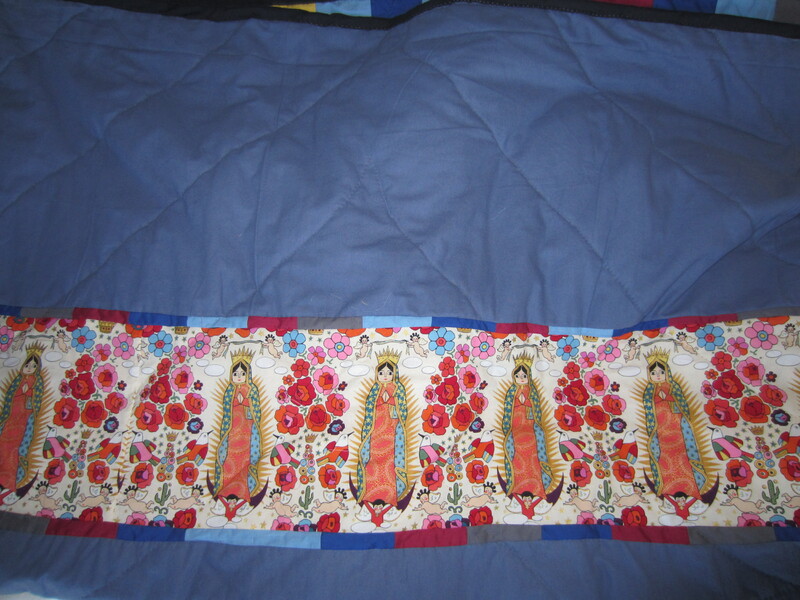 To celebrate the birth of her baby and her new life, I evoked the Southwestern palette (& sun!) 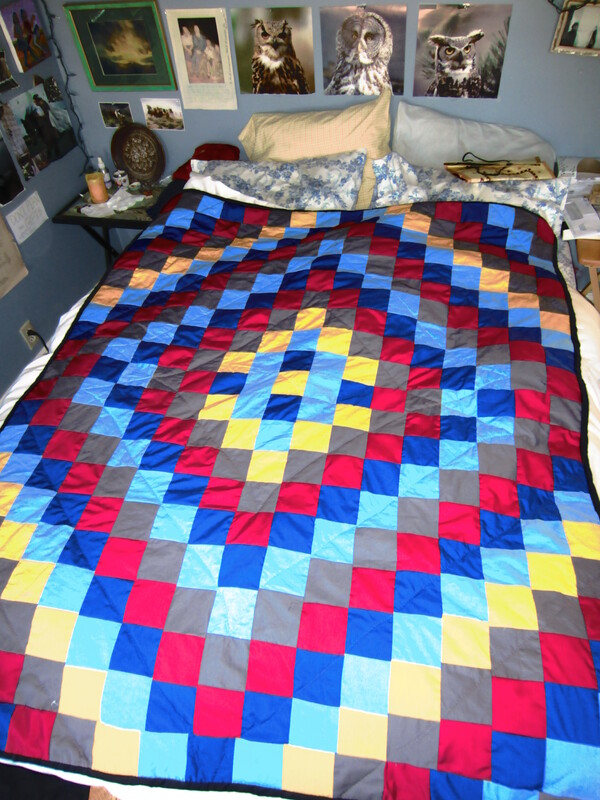 in this quilt. 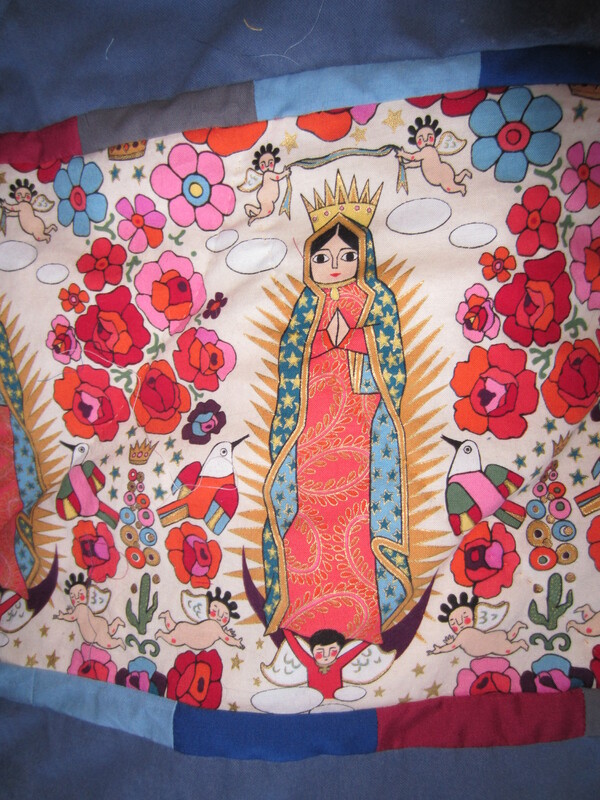 I added this bright shining Our Lady of Guadalupe to share all the moments, big & small, with her. And I made sure to use a soft blue flannel in the backing to hold in that warmth. 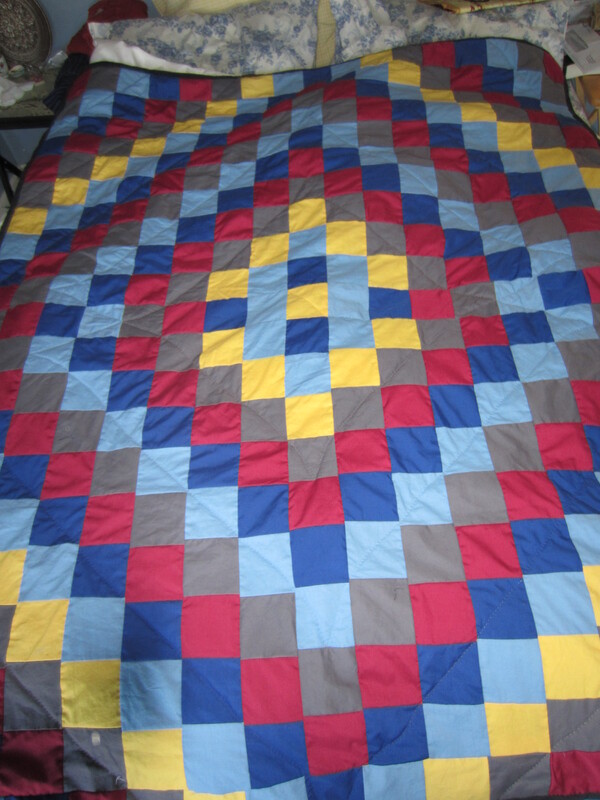 In true Gift Fox fashion, I pieced together the entire quilt top in an 8-hour day (!) while puppy-sitting at Marla’s house. That day in mid-October, I sat at Marla’s dining room table, whipping these strips of fabric through my old Singer, weiner dog & white retriever dog at my heels, leaves falling, humming a song.